ObjectPlanet's PngEncoder lets you encode java based image objects into various PNG images at fantastic performance compared to other png encoders. This PngEncoder is the fastest java based png encoder we know of and has a very small footprint of just a few kilobytes. The encoder is free of charge, while the source code is available for a fee. 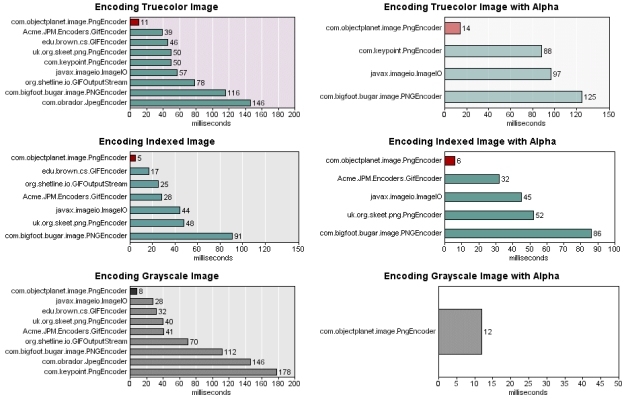 Below are tests done comparing our java png encoder with other java based image encoders. The image encoded is the chart itself, and the chart is generated by our EasyCharts product.